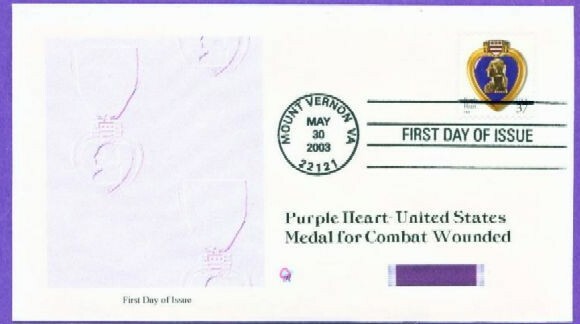 McIntosh Cachets #1 issue is the first Purple Heart issue (May 30, 2003). As you browse through our offerings, you will find cachets with earlier dates. These are cachets that were either submitted after the Purple Heart issue or add-on cachets, created after the Purple Heart Issue was done. There are some slight color variations with this cachet. This was due to the printer used at the time having color consitency problems. It was replaced with a new printer during the time McIntosh Cachets #1 was being printed. The inconsistency of the initial printer and the change to a new printer "mid-stream" caused the purple background color of the cachet to be somewhat different between early printed copies and the later printed copies. We have "mastered" the color consistency issues we experienced early on and this is no longer a problem. All issues are now printed on a high quality color laser printer with excellent results.